Lolly Chops has a so very cute owl tutorial and pattern to grab. I am so loving owls at the moment and have got to make some of these. Lolly Chops has a heap of other freebies here too. Jenny at Elefantz has a Wonky Houses BOM to grat....cool wonky house you can stitch up. Vickie has some sweet applique/stitchery patterns to grab. A bluebird and heart and a Butterfly and Heart. 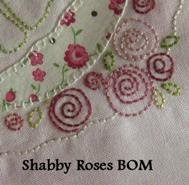 Elefantz has a lovely Shabby Roses BOM for free so go grab these sweet stitcheries. There is an easy tutorial on making fabric yo-yo keychains over at Sew Thankful. Good little extras for gifts or fetes. 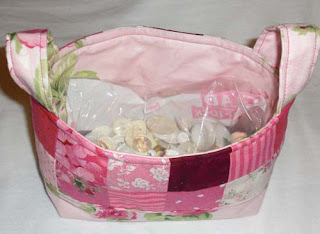 This site uploads a new pattern each week, bags, quilt etc, worth keeping an eye on. If you pop over to Prims by Kim you will find a lovely Prim Bunny to grab. Better Homes and Gardens have a cute Cardinal pattern to make ornies with. I can see this primmed up a bit myself...being the prim lover I am. Polka Dot Pineapple has a tutorial for a fancy tissue cover/holder here. Oh Frannson has some great tutorials on different things. Bags, quilts, cushions and more. I myself love the Margaret Bag. Hugs and Kisses has a free Armchair Caddy to make here. Quilt Taffy have a tutorial to make an Elephant Softie here. Sew Chic has a really cute bag to make using 2 fat quarters. I really like this bag and I just love the fabric she has used. This tutorial she has is to show how she inserted the zipper for the inner pocket for her handbag. She has purchased the pattern for the bag elsewhere. Marcus Brothers have a heap of freebies on their website. Grab a cuppa and have a look around. I just came across this cute fabric flower brooch over at Primrose Corner. Might have to give this a go...would be great on a tote bag or purse. Julia also has a tutorial to make a denim jeans bag...she is using the leg of an old pair of jeans...a cute little bag. Needlecrafter had heaps of patterns for stitcheries or embroideries here. Gail has a lovely free BOM to grab called Christmas Wish. Mama Sparks BOM My Neighbourhood is made up of cute house appliques. 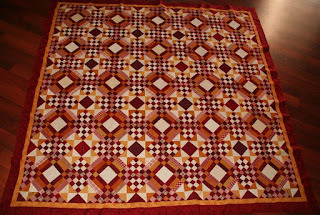 Quilters by Design have instructions and templates to make easy Dresden Plates here. They also have a heap of other quilting instructions here including, flying geese, attic windows and more. Better Homes and Gardens have a tutorial/pattern for a tote bag with six pockets. Another tote called Easy Breezy Tote Bag is here. Another called Lazy Days Tote. There is a lunch sack here. They also have a dainty pincushion to make. There's a sewing roll here. A pretty clutch purse here too. Scrapbooking ideas are there too. Have a good browse of this site....there are heaps of tablerunners or table toppers here. Lots of quils patterns there too. This is a really cute one...its a baby quilt but I would love it made up bigger. There is a pattern/tutorial for a reversible raggy tote bag here. The Clever Quilter have a tote bag freebie here. Butterick freebies can be found here. Zippered wrist purse, sewing organiser, tie bag, christmas stockings, ladies house wrap and more. Slippers, coasters, wallets, crayon rolls and more..
Homespun-Threads has a heap of links to freebies...some are hers some are from other sites. Crayon rolls, wallets, baby kimono slippers, coasters, and lots more. Softie Making has a heap of links to free Sotftie patterns. Teddies, zebara,dolls, caterpillars, bunnies and lots more. There is also a bunny here. Bitty Bits and Pieces has a few different tutorials on their blog. An altered Nine Patch quilt, pincushion, tablerunner, I-pod Keeper and lots more. Q.D. Patooties has a cute Sock Elephant tutorial....really cute. Park City Girl has an easy tutorial on mitred corners. Very easy to follow. The Blog Doctor is the BEST place I have got help from when you need to know anything about blogging on blogspot. Primitive Betty has a nice prim sheep you can use for stitcheries or punch needle projects. 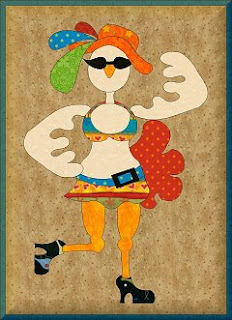 OMG you have got to take a look at these Chooks that Sindy over at Fat Cat Patterns has come up with. They are awesome....and would make up a great quilt. This is just one of the chooks she has. You could use them for a stitchery as well. You will find a laptop sleeve tutorial here. Your laptop will be protected from scratches and bump in this case. Living Creatively has a lot of different tutorials here. Wallets, bags, business card keeper, apron, needlecase,i-pod cover and more. A Spoonful Of Sugar have some tutorials worth looking at here. A covered tapemeasure, loyalty wallet, and a passport protector made in fabric. There are also some other tutorials here. This is a great site to browse for Quilt related projects including, blocks of the month (BOM), pieced and applique blocks, paper pieced patterns (PP), mysteries, quilting designs (QD), quilt labels, wallhangings and small projects. Lolly Chops has some cute designs that can be used for stitcheries, appliques or even scrapbooking. Birds, flowers, trees, frogs, whale. There are also heaps of printable tags, labels, paper, cards etc here. I love most of the things she has here. Cheryl Seslar from Raggedy Scrappin offers these great freebies. The Ruby Doll is a simple and versatile small doll free from One Red Robin. Jhoanna also has a cute Mushroom Girl and Bunny stitchery there too...and a cute heart swag called "Sweethearts". Christies Creations has a nice tutorial to make a wallet to hold your tea bags/satchels in. Polka Dot Pineapple also has a tea wallet tutorial here. 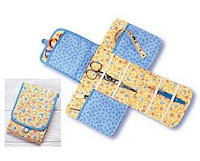 Cicada Daydream has a tutorial to make a zippered purse/organiser. Clear step by step tutorial. She also has a tutorial for an Apron here. My Spare Time has a a nice pleated bag tutorial that looks fairly easy to whip up. Made By Rae has a nice bag pattern for free called Buttercup Bag. Crafster has a tutorial using the Buttercup bag pattern but slightly altering it. I think this tutorial looks easy to follow. 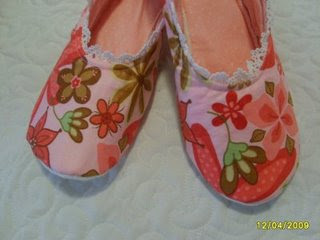 Shabby Raggy Roses as a cool tutorial to make some slippers. Take a look at these neat slippers. You can download a Parosol Magazine online here. Baum Mill Textile has a heap of freebies....quilts, tote bags, aprons, teddy, and cushions. Worth the look. There is a great pattern/tutorial over at Soule Mama's called the Gratitude Wrap. It holds a notebook or note cards and postage stamps when finished. There is a nice tutorial here for a tote/project bag called Two-Kates Project Bag....seems like a nice clear easy to follow tutorial. CQ Magonline seems to be a great magazine for quilters. Lots of information, tips, ideas and some patterns. Instructables has a great tutorial for a Biscornu pincushion and scissor fob. You will need to sign up for free membership to download the PDF pattern but it was quick and painless. Biscornu (offset square cushion)- Biscornu is a French adjective that means "that which has an irregular form, with projections" or "complicated and bizarre." To a seamstress or an embroiderer, a biscornu is a tiny eight-sided embroidered pillow that can be used as a pincushion, an holiday ornament, key chain/cell phone decoration, a scissor fob, the centerpiece of a wreath, filled with flower petals or herbs to make a sachet... They're great for anything that you can think to do with a tiny cushion. Biscornus can be cross-stitched, embroidered, hardangered (is that even a word? ), anything as long as each side is square and the same size. Dolores has passed on a link for biscornu patterns here. They are in French but you could use the google translator if you need to. Thanks Dolores. A simple fabric bucket that has been designed to be rigid enough to stand on its own, yet pliable enough to be folded for easy storage. You will need to sign up for free membership to download the PDF pattern but it was quick and painless. The Sometimes Crafter had an easy tutorial for a quick bag with a bird applique on it. I really like this bird and could use it for many things. You will fina a cute little kitty and rabbit to download over at My Little Mochi. Goosie Girls has a cute heart shaped embroidered needlecase tutorial. An online primitive magazine to grab called Primitive Times.They have a heap of back issues you can download too. Allsorts blog has a very clear and easy tutorial to make a crazy nine patch block quilt. It is like a "stack & slash" type nine patch block. Very effective and funky looking. I really need to do this like everything else that is adding to my never ending list. Allsorts Blog has a terrific tutorial to make some coasters. Love these little quick projects. This is one cute Monkey. Pop over to mmmcrafts and grab the pattern to make her up. 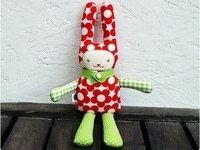 This is a cute Bunny Softee pattern by Revoluzzza....and another one similar without the legs is sooo cute too. There is also Olly The Owl tutorial and pattern. Cut Out and Keep have a heap of pincushion tutorials/patterns you can grab. There has to be something for any pincushion lover on here. I especially love this one. Now I am not much of a knitter but these bunnies are really cute...I can see a heap of these sitting in a cute bowl for decoration. If only this little elf could talk, he’d be sure to tell you everything he’s been up to whilst creating toys in Santa’s workshop. This fun-loving character, designed by Jenny Stephenson of Jennabelle Designs, is dressed up for the festive season with his hat and boots adorned with jingling gold bells. Homespun have him to grab for free if you pop over here. Another lovely redwork pattern to grab over at Homespun called Kiss Me Tender. It is a heart with a bird done in redwork and made into a round ball ornament. 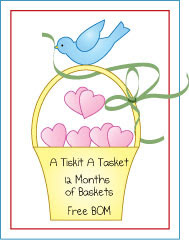 BOM - 12 months of baskets. Bunny Hill Designs has a really sweet BOM going at the moment. You can do them as a stitcheries or appliques. Take a look, you wont be able to resist them. Elizabeth over at Oh Fransson has the sweetest, freshest looking quilt made with logcabin blocks with a hint of ric rac added to just give it a finishing touch to each block. I just love these blocks and really would love to get some made up. Maybe once I stop adding freebies to the never ending list...lol...she has quiet a lot of tutorials over to have a look at everybody. Sew Mama has a Pincushion/Sewing Organiser tutorial on her blog that looks nice and easy. A great idea to keep your scissors, thread unpicker, pins etc together as well as a threadcatcher to throw those loose threads into. Sew Mama has lots of tutorials so scout around her blog and see what you come up with. Online Crafts Magazine with a Country~Prim ambience and charm you can enjoy right from the comfort of your very own Home! Pretty stitcheries can be found over at Elephantz blog. Pretty flowers, hearts, vases.. Jenny also has are reall cute bag pattern with some stitchery on it too. Wee Folk Art have a cute tutorial for an Owl Bookmark. This blog also has lots of other freebies on offer here. Create A Prim has some freebie stitcheries you can download. They also have free graphics and some doll patterns. I myself like the prim crow and bee make-do but there is also some halloween pumpkins and a witches boot. Prim Betty has a heap of freebies to print off and use as you desire. Some great sticheries there. Tea and Stitches has a cute stitchery to share for Easter. You could do it in in many colour or simply redwork. Even use the pattern for an applique. Sandra also has other stitcheries on her blog to download, like a St Patricks Day stitchery. There there is a Tea Time stitchery and also Snowmen stitchery. Just scout around her blogs and she has a heap of things for free. Thanks so much for being so generous Sandra. Retro Mama has the cutest fabric eggs. We have just gotten over Easter but these would be great made up for any occassion. This neat looking paper pieced teapot over at Pink Penguin has a great tutorial showing you step by step how to make them. Might have to give this a try. What a great idea to keep all your notions, scissors, rotary cutter, and bits and bobs. This fabric basket tutorial is clear with good instructions. This basket was made by Angela for me...isn't it terrific. For a nice camera case or pouch for anything you desire to use if for you can find a nice tutorial here. If you want to make a stylish pencil case pop over to Pink Penguin for a good tutorial. Fat Cat Patterns has applique patterns galore....Sindy has something for everybody there. So many, so little time. Quiltville is the best site I have seen for heaps and heaps of scrappy quilts. Bonnie is truly amazing...her talent blows me away. I was always so scared to step outside the box until I made my first scrappy quilt with Bonnie on her first Mystery Quilt. That was also my first mystery quilt so I really stepped outside my box. Her instructions and tutorials make things so easy. If you ever wondered what to do with your scraps, pop over and take a look. I am sure you will be as blown away as I was and still am. The Fat Quarter Shop has some great quilting patterns on their website. This Tablerunner is quick and easy. I know, I made one but made it two rows shorter to fit my coffee table. The Moda Bakeshop has some great tutorials. Tablerunners, pincushions, quilts, fabric baskets and more. Very clear instructions. Clear here for the recipes Moda Bakeshop have using the different pre-cut packs. The Storque an Etsy store has a lovely tutorial for a Bedtime Duvet for a baby. Ottoberwoman has a lovely bag pattern available top download here called Dotted Dream. The Stuff I Live For blog has an "Easy Wallet" tutorial...very easy and quick to make up and could be used for lots of things. Coins, credit cards, store cards, even personal items. Purl Bee has a nice tutorial showing you the basics of how to crotchet. She has lot of knitting and crochet tutorials on her blog too. Liz over at Confessions of a Fabricaholis has a clear step by step tutoral to sew a wallet. Darn Kat has a terrific tutorial with clear step by step instructions to make a wallet. Something I want to give a go very soon. Dont Look Now Blogspot has the cutest appliqued "Honey Bunny" cushion. Kellie really does beautiful work. Even if you dont do it you have to have a look at it. She has a few tutorials on her blog for appliqued things. Drop on over to my other blog Sew Prim Khris for an easy needlecase tutorial. I have made lots of these as they are great little extras for gifts or swaps. Bitty Bits and Pieces has a nice charm Square tutorial to make a quilt or for something smaller a tablerunner. Quilting Is Still My Passion has a nice clear tutorial on using up your crumbs of fabric leftovers. Why waste your scraps when you can use them up and make a scrappy quilt or anything else you may come up with. Laughing Purple Goldfish has a terrific tutorial on how to crochet a rag bag out of stips of fabric. Looks so simple and a must for me to try. Imagine using up some of that fugly fabric you have in your stash. Twelve 22 has a nice clear tutorial on how to put a zipper in a pouch or coin purse with nice tidy lining and no ugly seems in sight. Terry Ann has a nice tutorial on how to make a notebook and pencil/crayon keeper from fabric. Very clear instructions and pictures. I have been searching for tutorial Sock Monkey tutorial and have come across this one which seems to be easy to follow with plenty of pictures to give a helping hand. Oh Sew Doll Dollin have a really cute/prim Raggedy Annie called Long Legged Big Haired Annie to grab. This could be made as cute or as prim as you like it to be. The Cats Pyjama's has several free patterns. My favourite being the Raggedy Annie. You can make her as cute or as prim as you like. If you pop over to my blog Sew Prim Khris you will see the one I have made for a swap I was in. Buzzy Bees has a Saltbox House Stitchery to grab along with some great alphabet fonts you can download to print for your stitcheries. Victorian Ornaments pattern to download over at Two Dancing Crows. Sassafrass Hill have a few free primitive patterns to grab if you are a prim lover like myself. I love her patterns and have a few of them. So many patterns, so little time. At the moment there is a pear, heart makedo, printable feedsack print, snowmen ornies, birds, tags. Creative Times Magazine is a terrific prim magazine that can be downloaded. They also have the back issues in the archives. For the PRIM lovers like me, you will find a great free pattern over at Tennesse Ridge Primitives. Daisy Crow Ladybug Makedo. She changes the patterns and then the previous one is gone. Here you will find an online magazine you can download every three months with interesting quilting information, patterns and tips. The Cutest Blog on the Block blog have a range of blog secrets. Learn some secrets to making your blog the best blog on the block! The first post here has to be free backgrounds for our blogs. I have been asked many times where I get my backgrounds from for my other blog so setting this blog up, the first thing was to put up the new pretty background. There are lots of talented people out in blog-land that offer freebies. The following are where I have found mine. If you have any problems setting up your blog just leave me a comment and I will do my best to give you a hand.